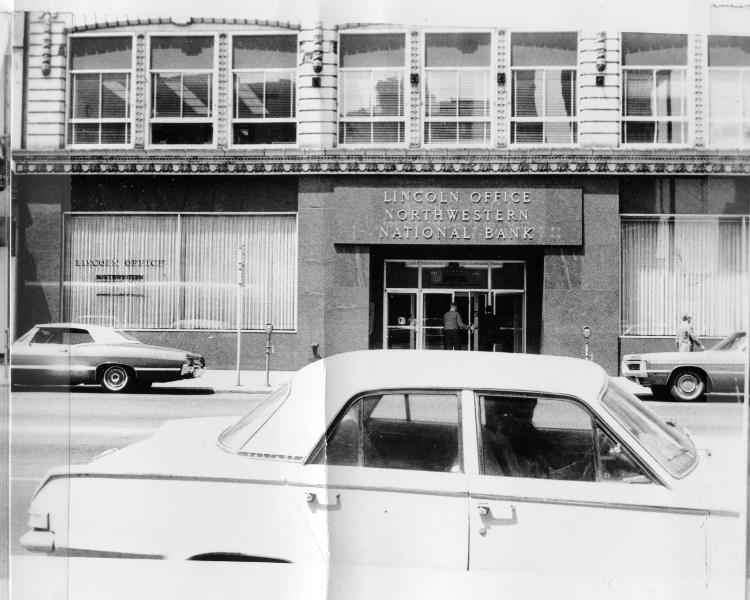 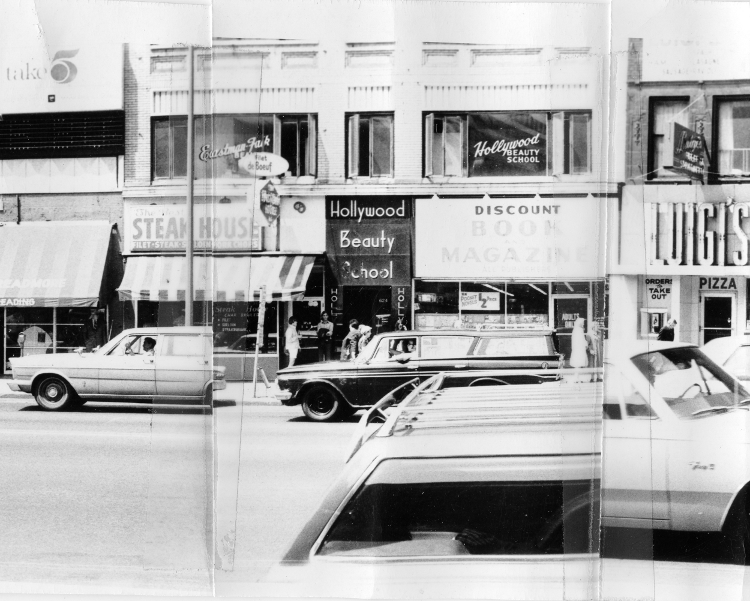 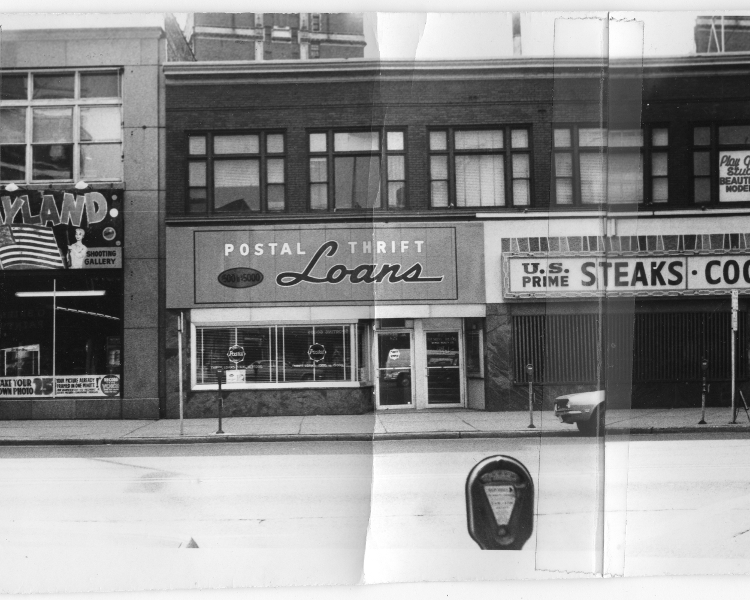 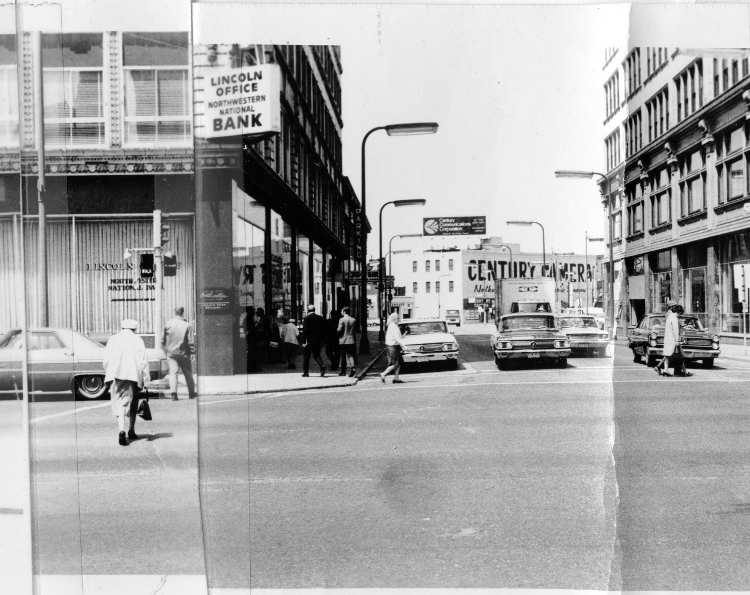 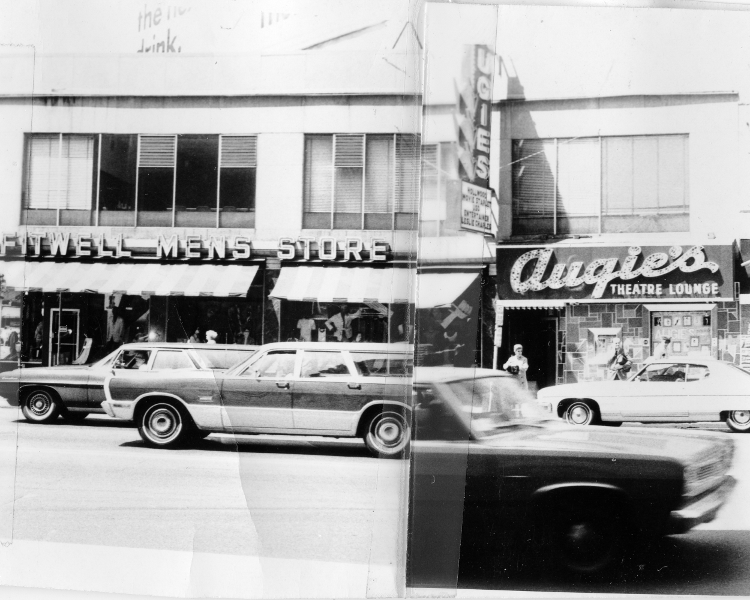 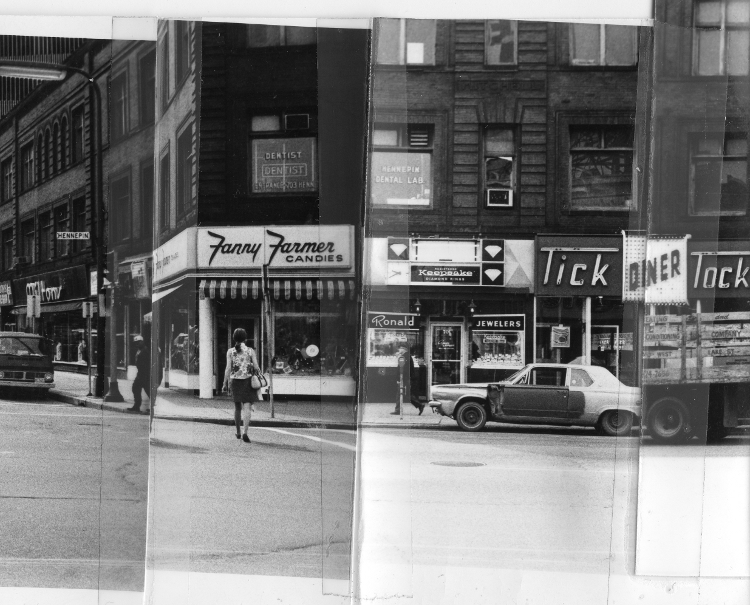 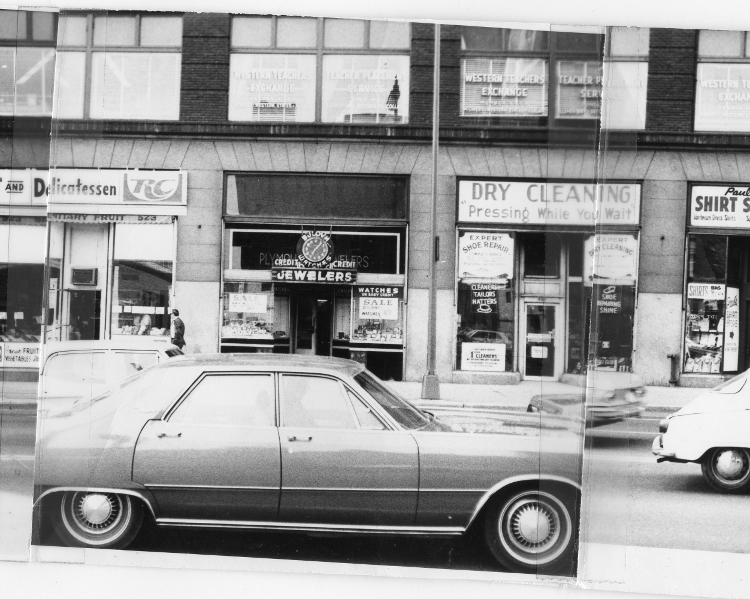 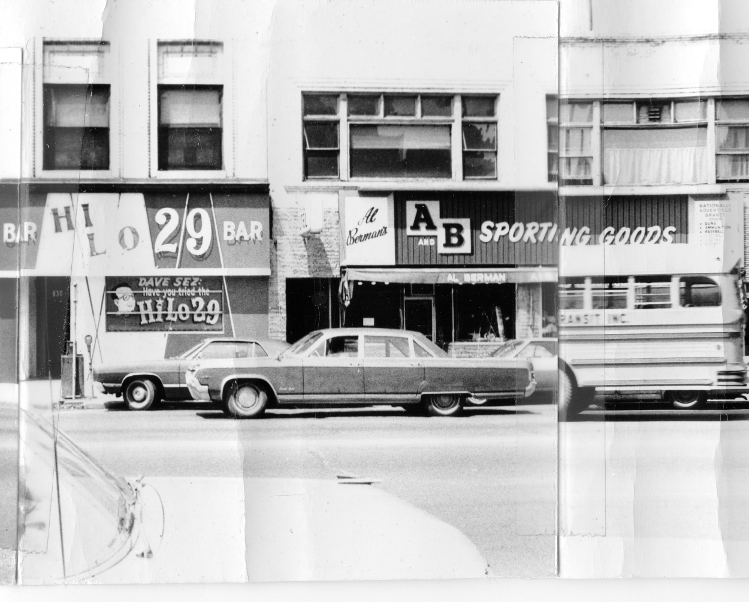 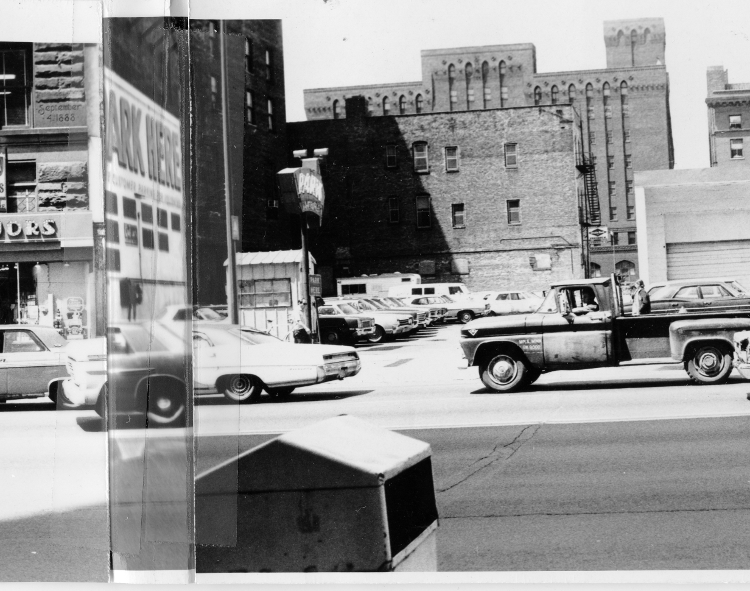 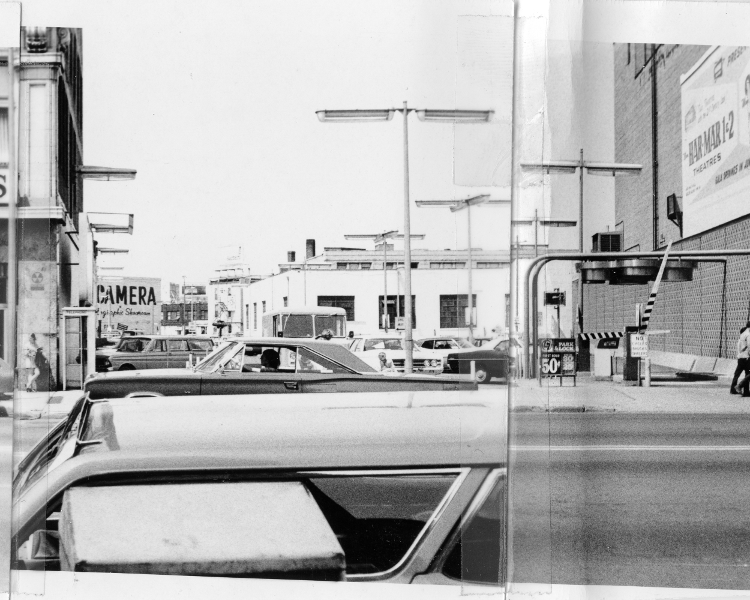 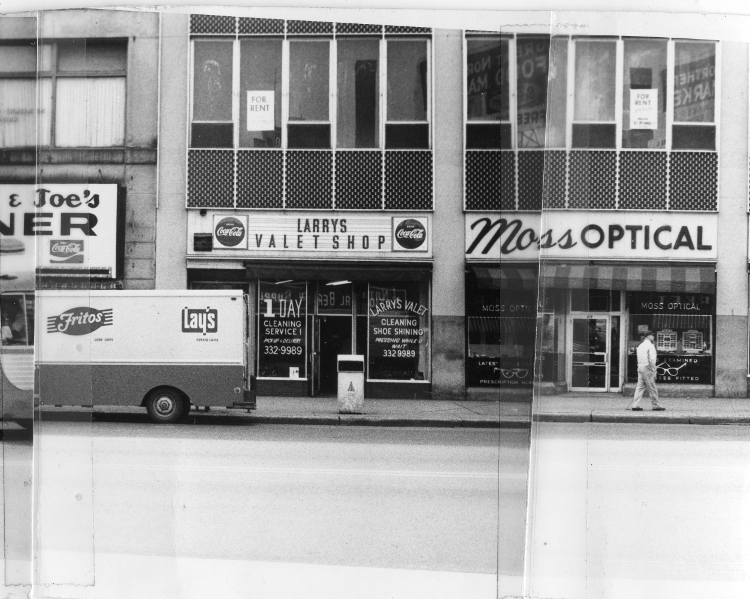 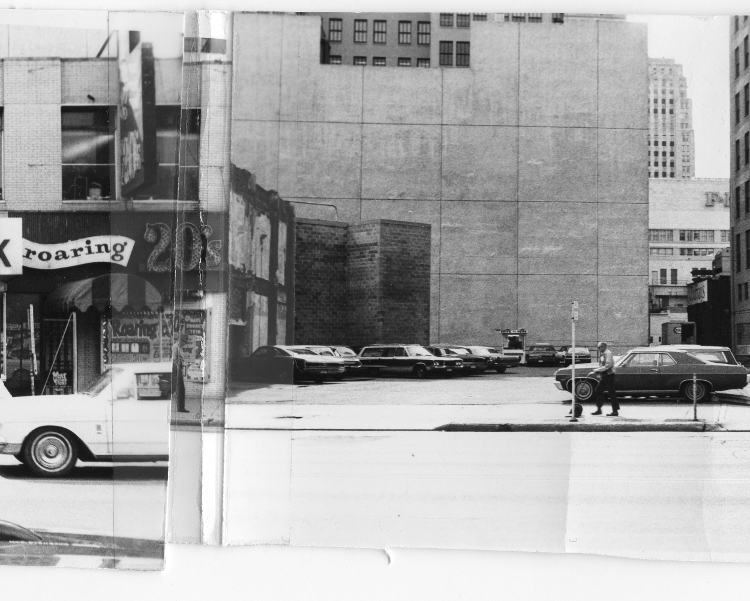 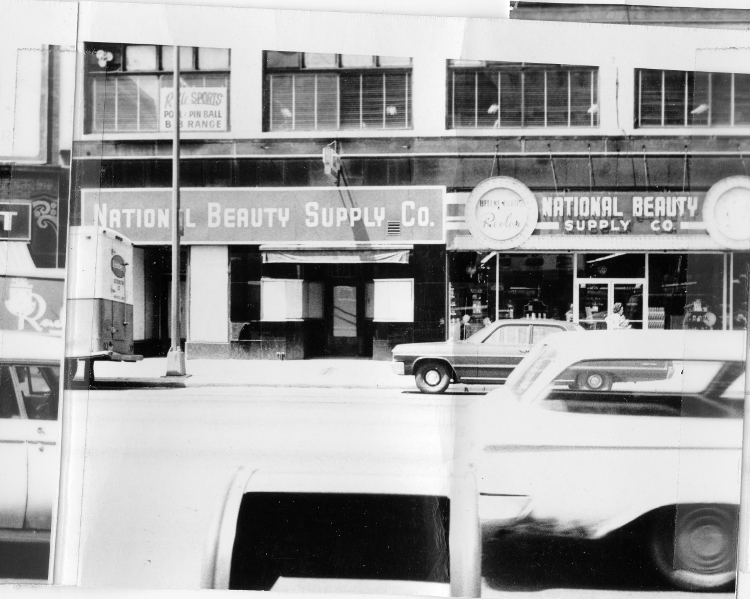 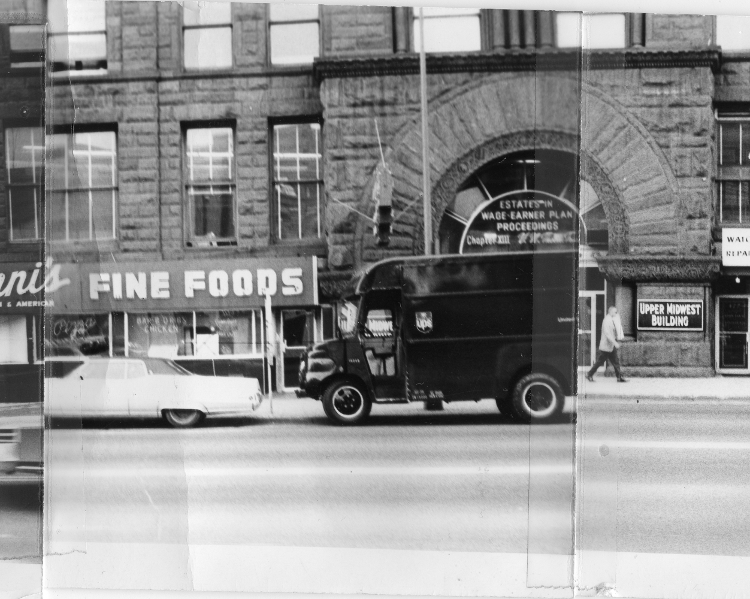 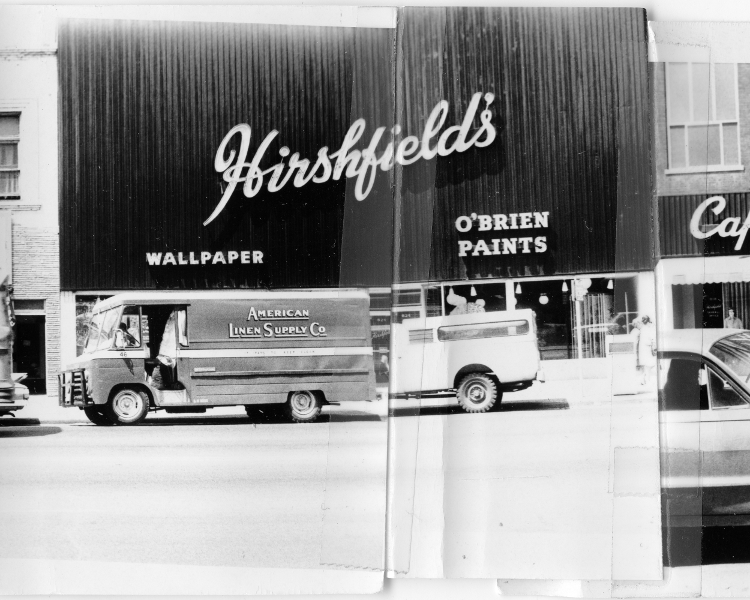 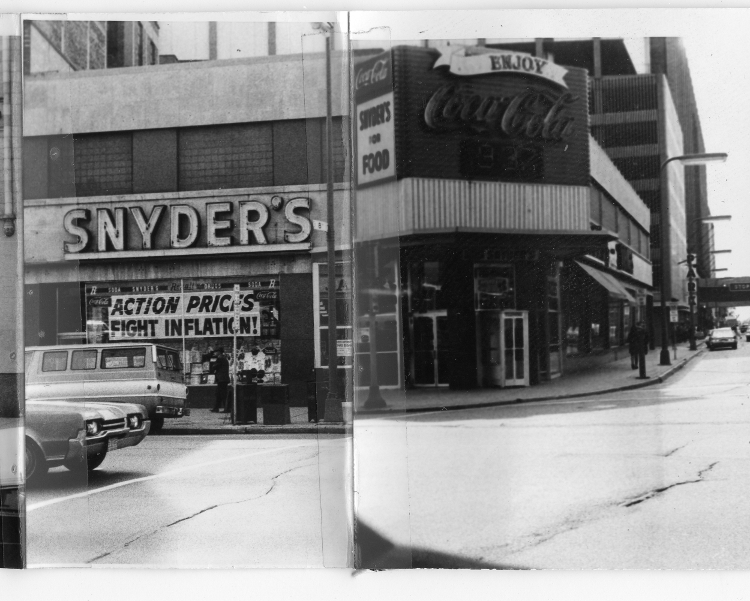 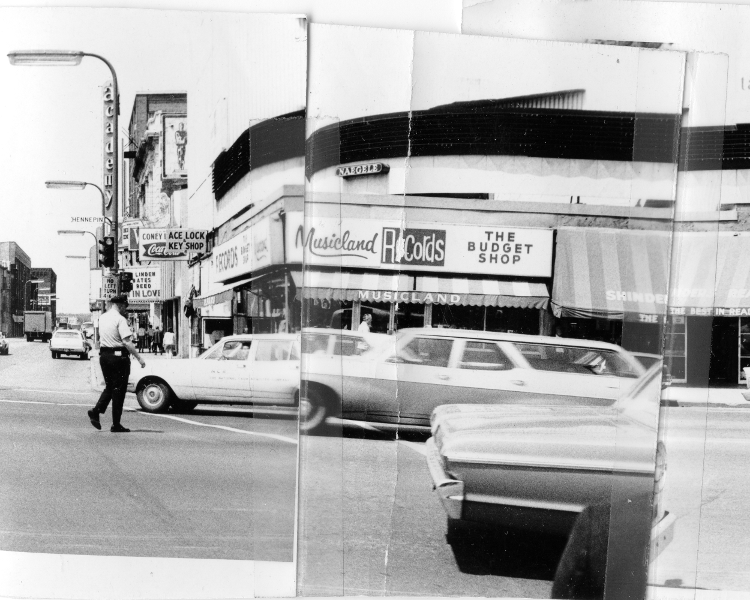 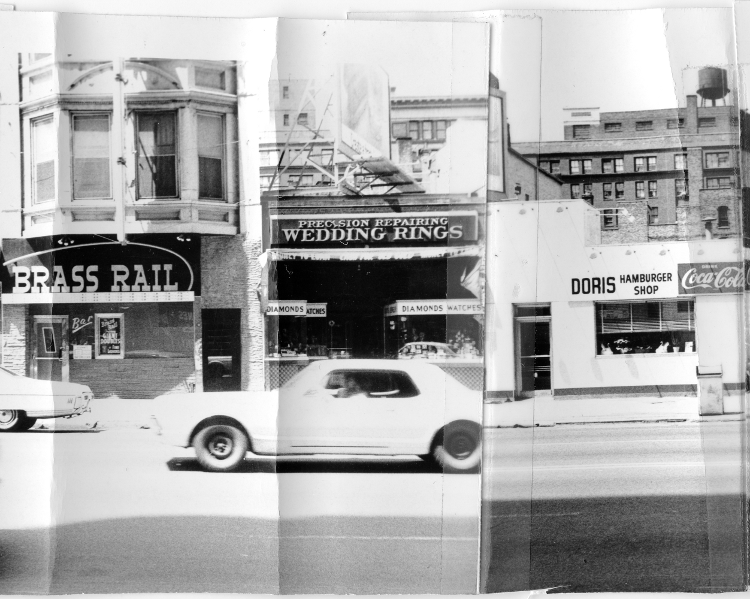 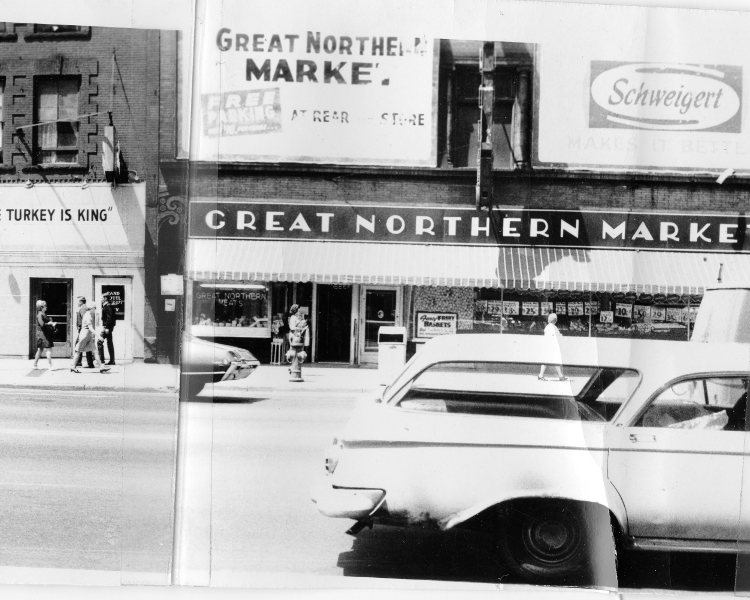 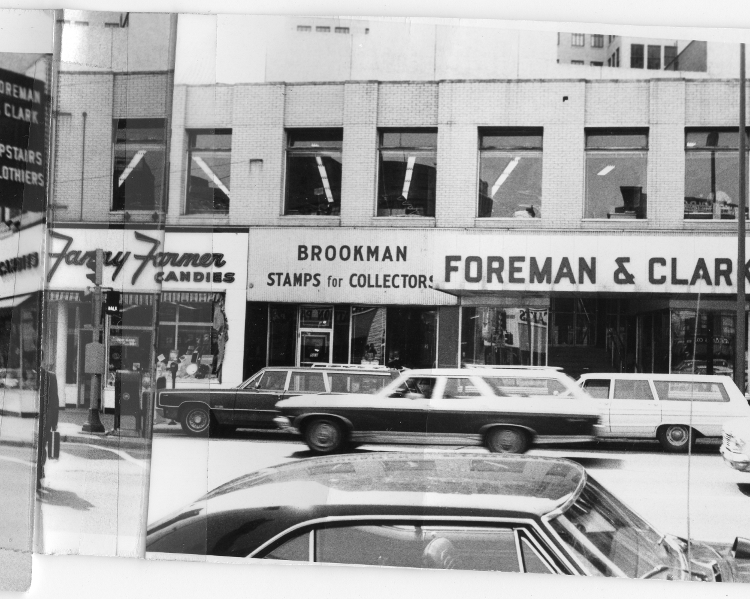 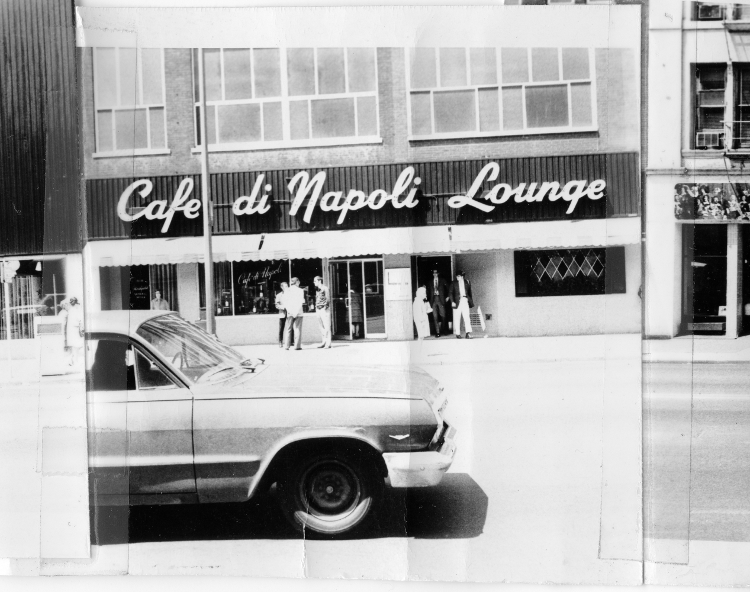 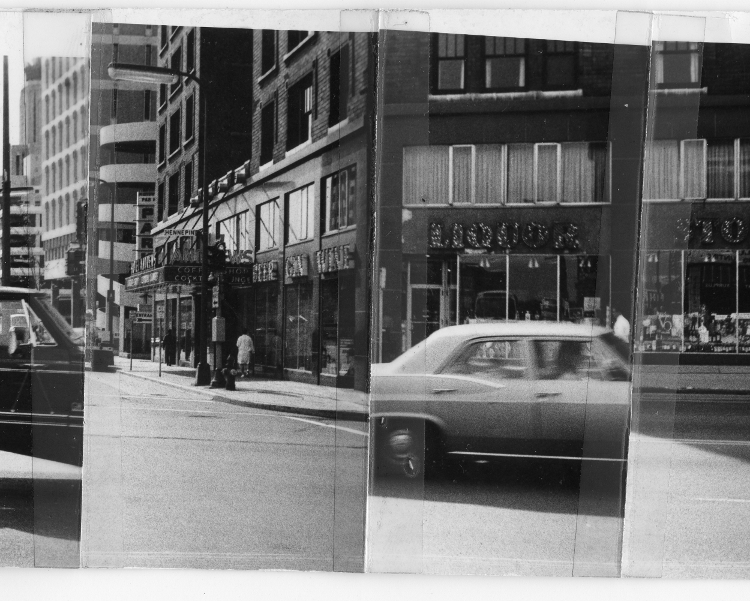 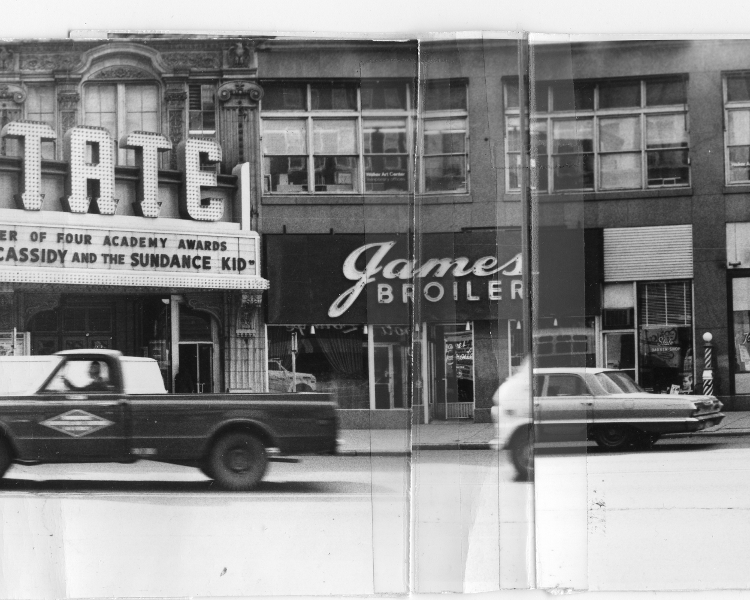 In the early summer of 1970, an employee of Minneapolis city government did a photographic survey of Hennepin Avenue downtown. 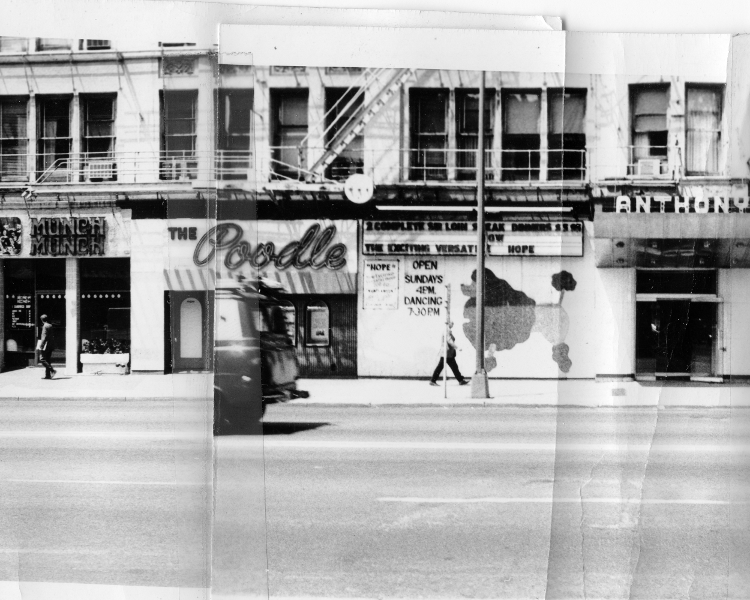 The goal was to document six blocks of the city’s most famous avenue, on the border of the newly demolished skid row, where its “bawdy charm” was most pronounced. 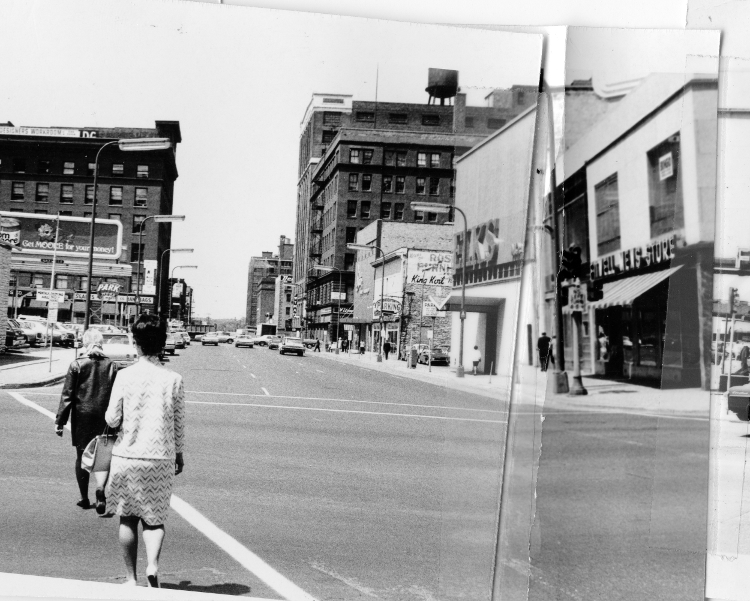 Developed as a main artery for the nineteenth-century city, Hennepin Avenue was one of the oldest commercial strips in Minneapolis, linking the Mississippi River to the southwestern chain of lakes. 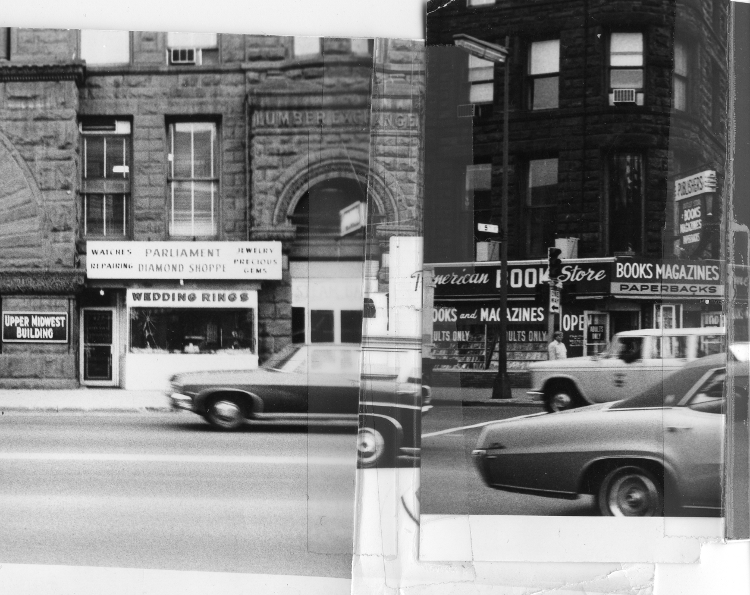 The photographer walked the east and the west side of the street, taking a series of black and white snapshots in quick succession. 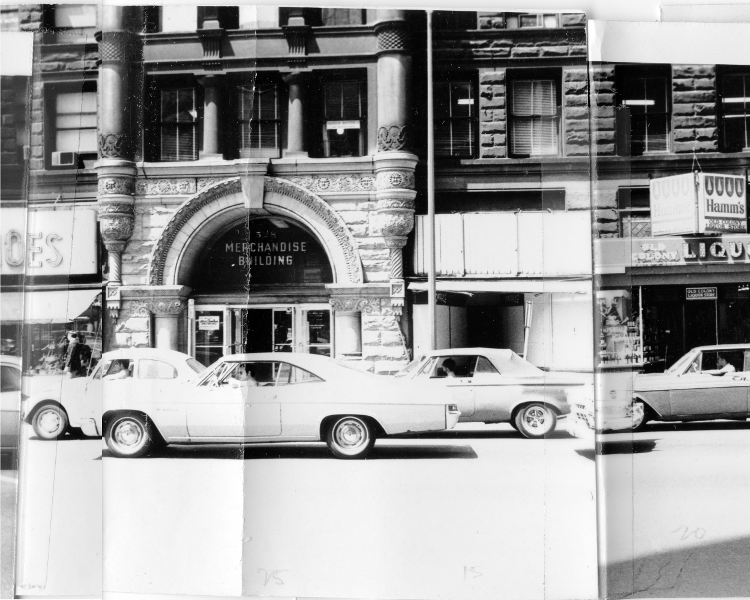 The images were developed, printed and then taped into two crude panoramas, each stretching four feet in length. 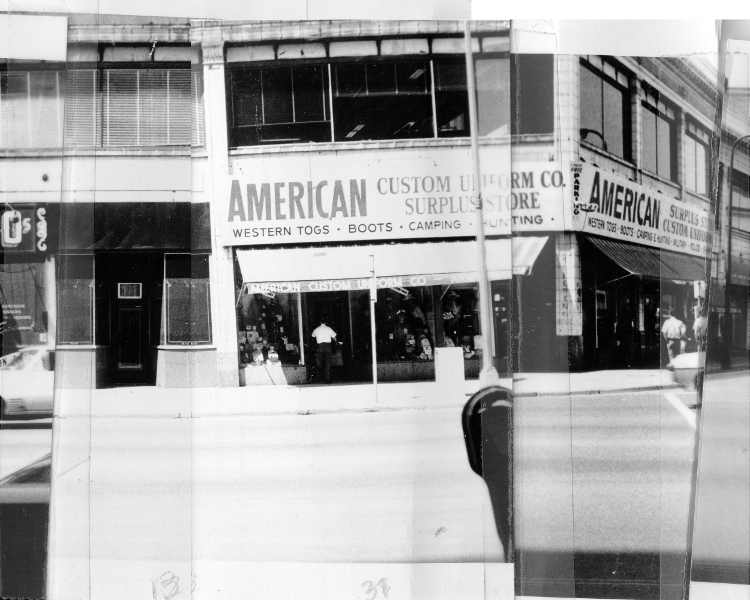 One strip shows the east side of the street; the other shows the west. 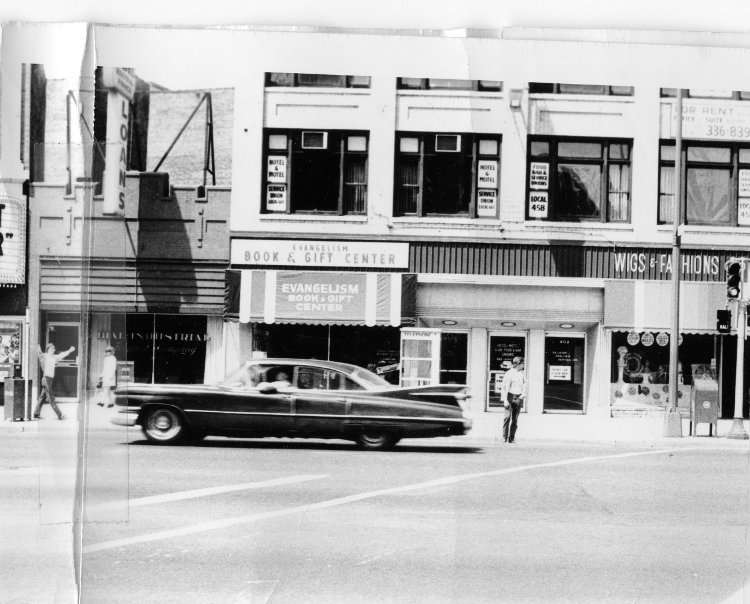 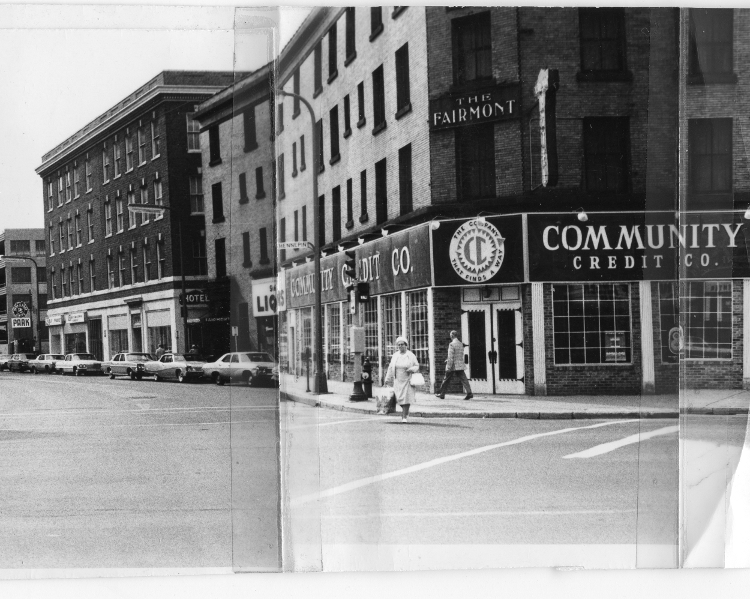 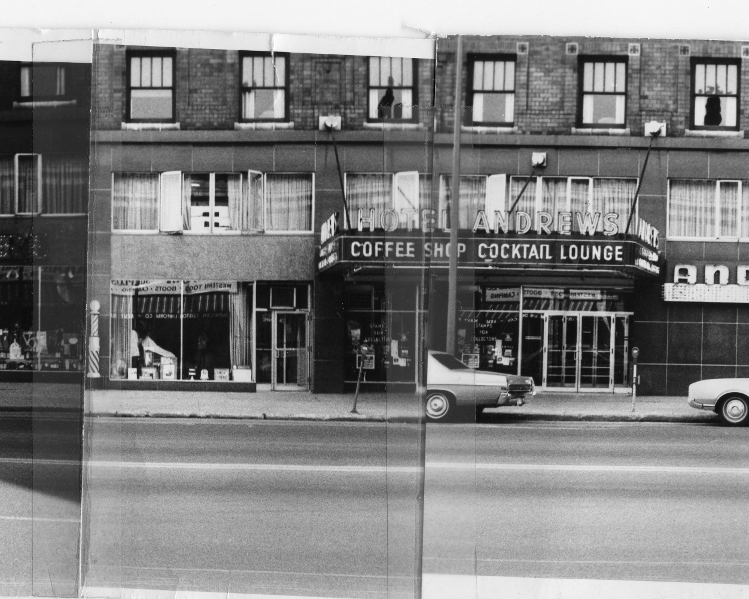 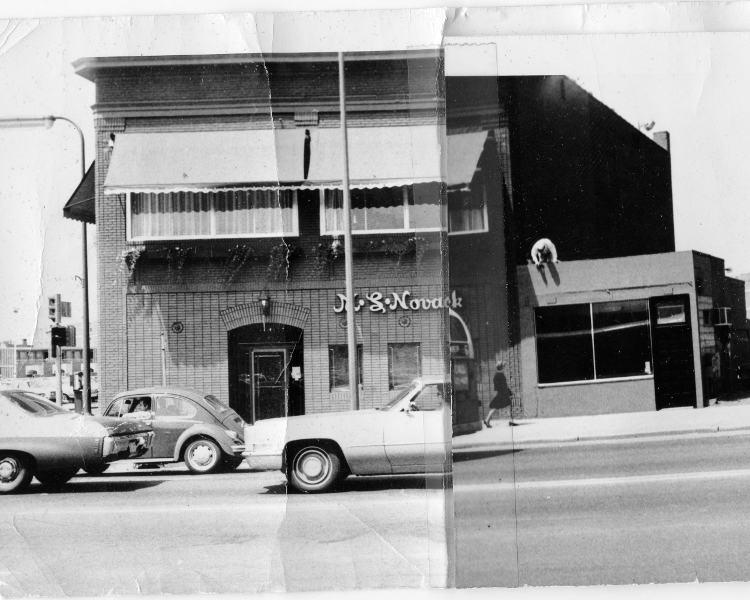 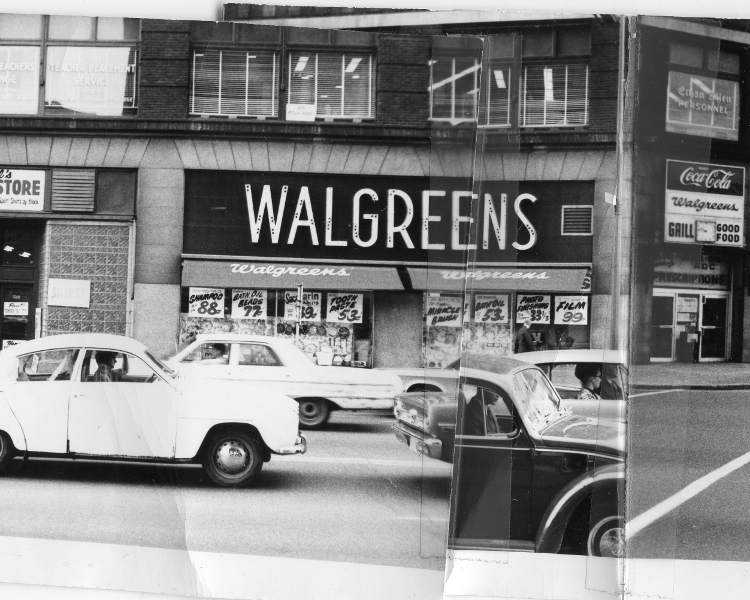 After Historyapolis citizen-researcher Dan Wilhemsen stumbled on these curled-up panoramas in the tower archives at City Hall, we decided we wanted to share them with all of you. 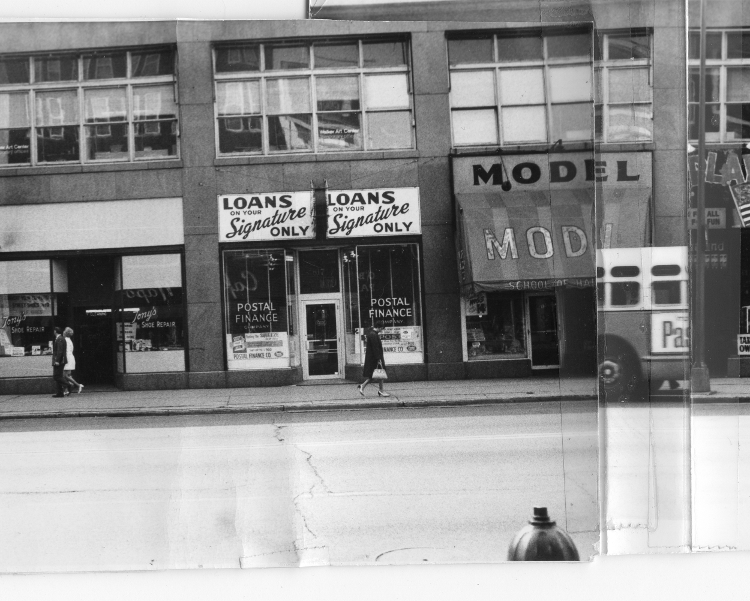 The photographs are not annotated. 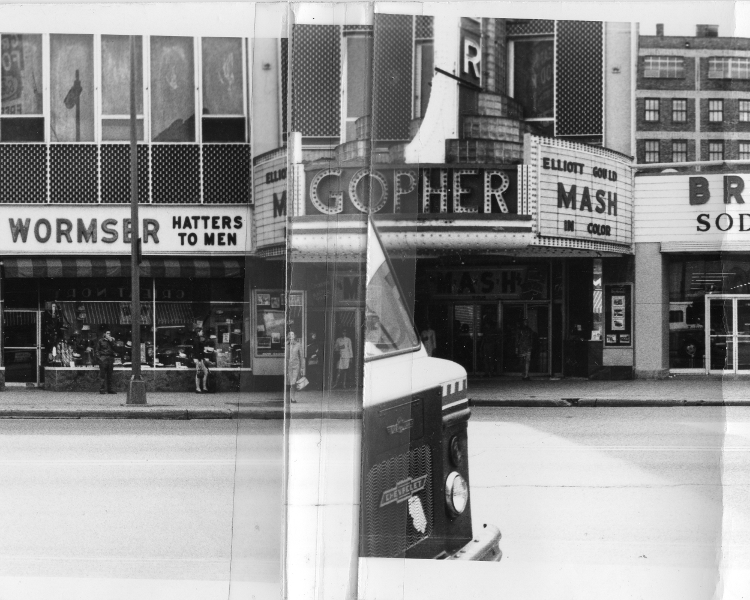 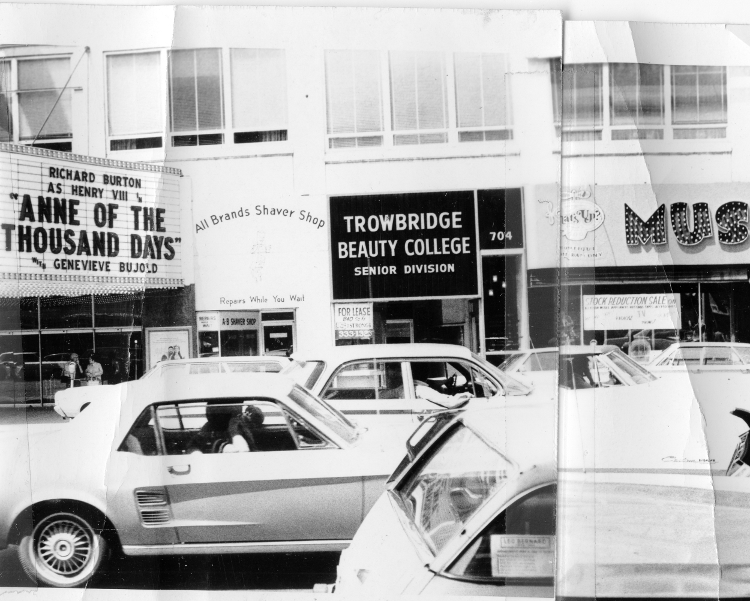 But the movie marquees helped us to fix the approximate date they were taken. 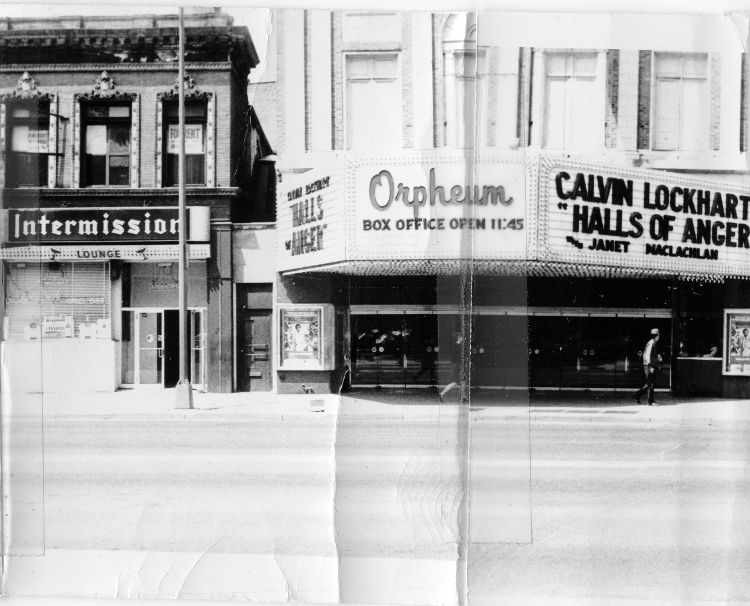 The Orpheum Theater–a first run cinema at this point –was advertising “Halls of Anger,” which was released on April 29th, 1970. 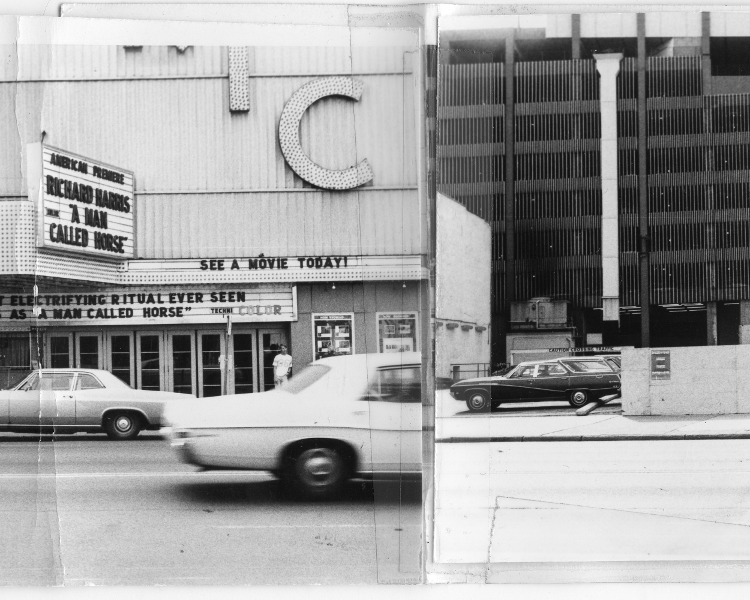 “A Man Called Horse,” which came out on the same day, played at another venue down the block. 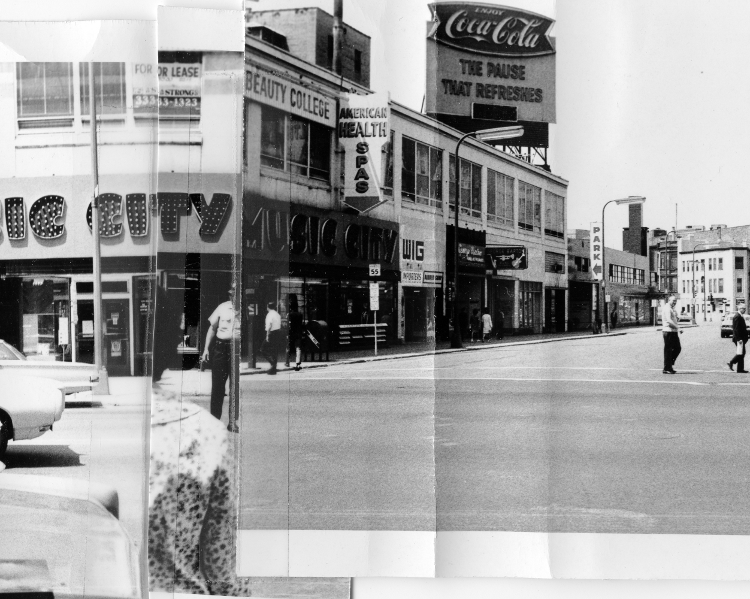 Thanks to Google streetview and the increasing fascination with urban “street” art photography, these types of images seems utterly familiar to modern viewers. 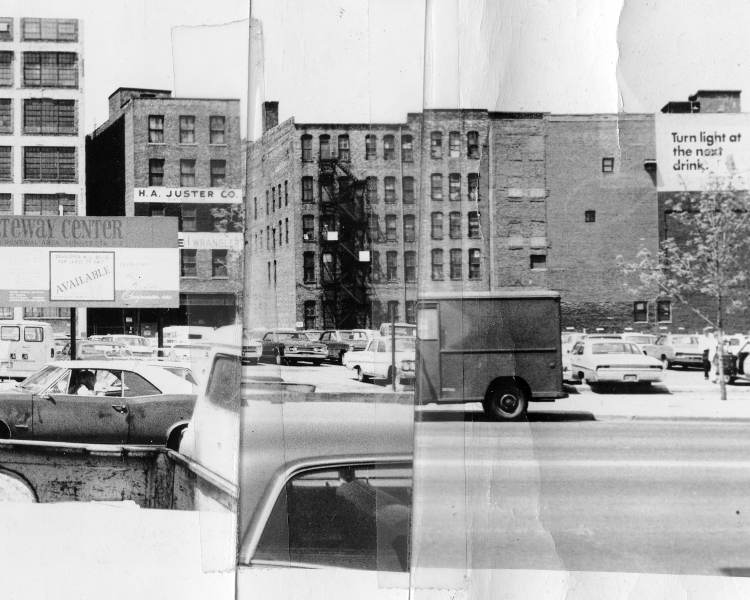 But there is nothing high-tech or artsy about this project, which was supposed to provide an utilitarian and unvarnished portrait of the city’s grittiest blocks for urban planners and community leaders. 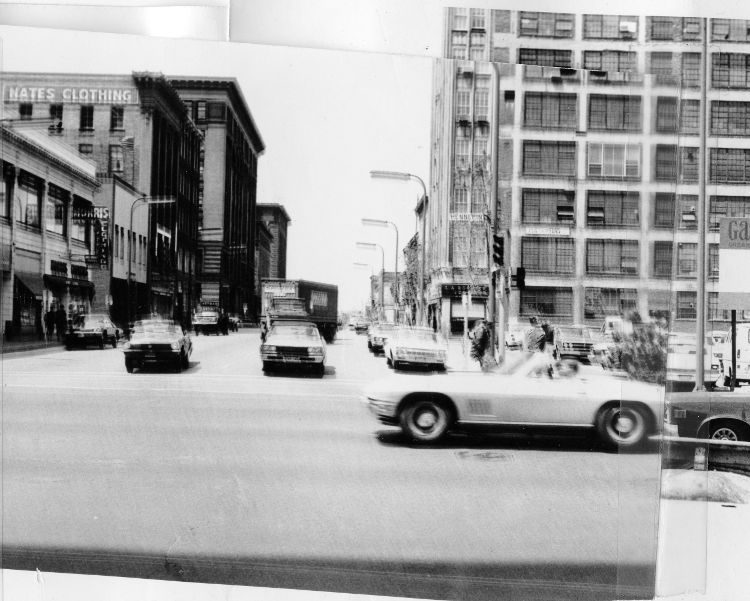 When this panorama was created, this stretch of Hennepin Avenue was viewed as a hard-to-ignore blemish on the face of an otherwise model metropolis. 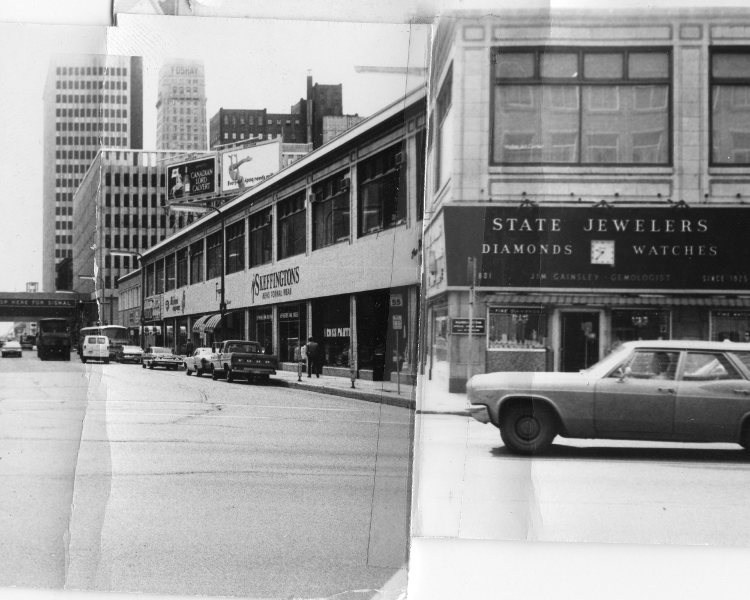 In 1966, the Minneapolis Star called it “a street with a personality problem, beckoning only the more adventuresome to its strip joints, paperback bookstores and streetwalking businesswomen and their agents.” It was encircled by ambitious urban renewal projects, bordering the massive Gateway Center district that sacrificed 40 percent of the downtown in an effort to eradicate the region’s largest skid row. 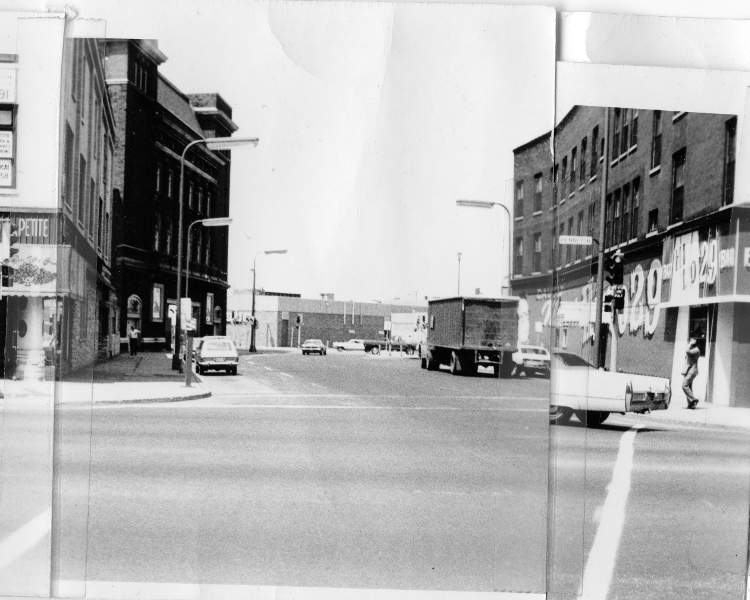 The plan was to replace this nineteenth century streetscape of bars and cage hotels with a futuristic district of skyscrapers. 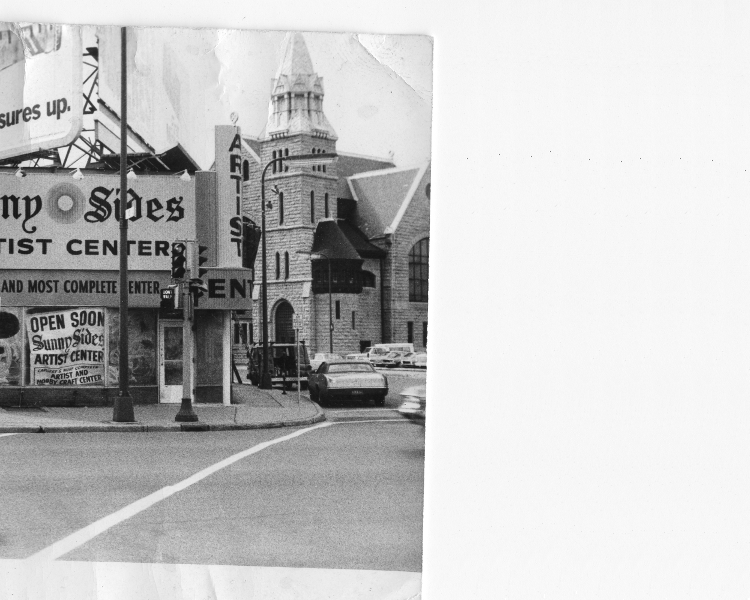 The historic buildings came down. 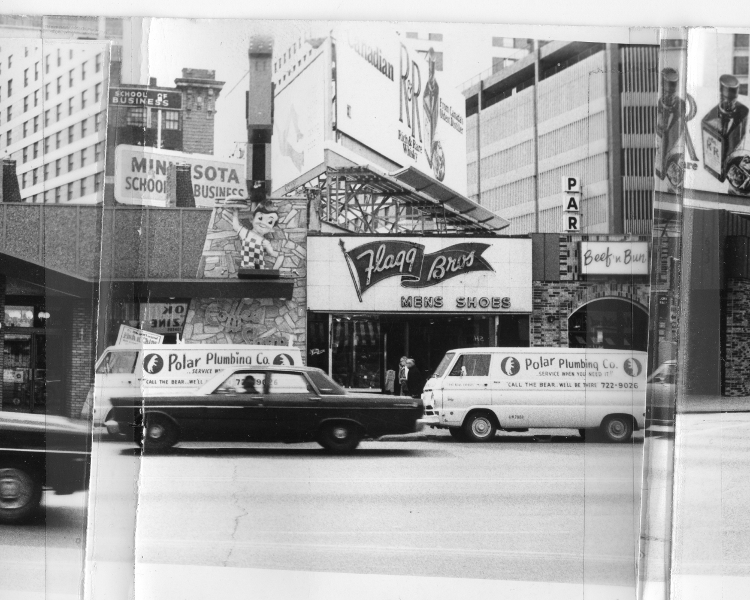 But of course this Minneapolis Futurama never went up. 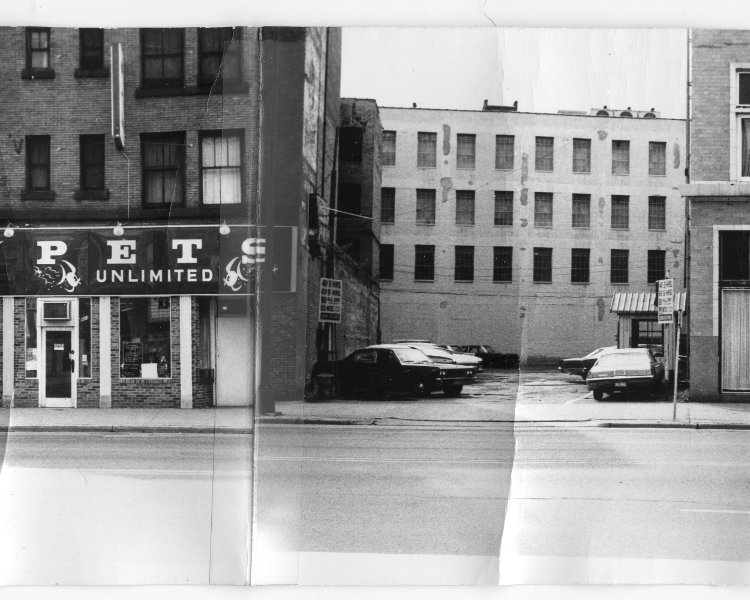 These images show how the reality of the avenue contrasts with the dazzling vision of city planners. 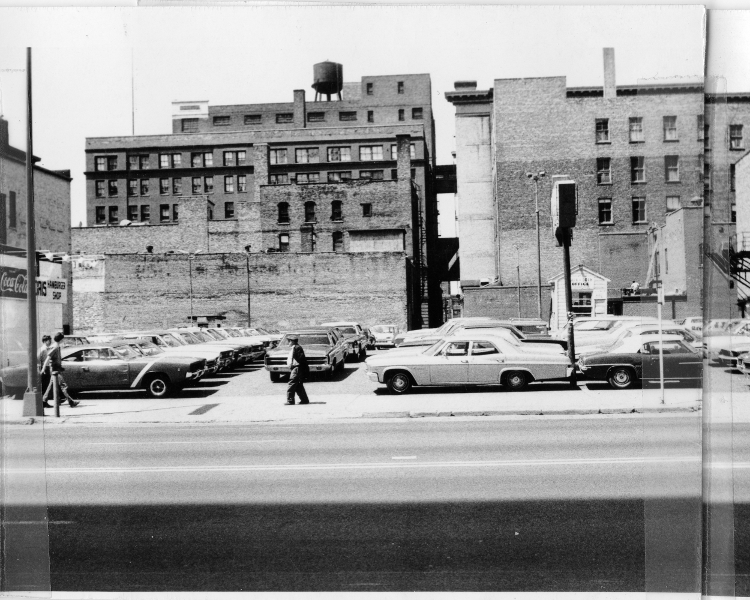 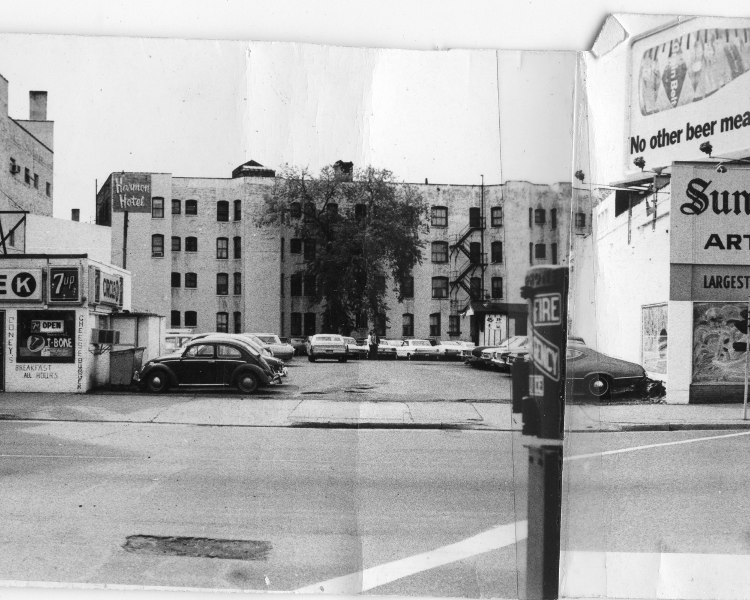 More than a decade after the Gateway redevelopment was supposed to catalyze the creation of a modern city, this panorama reveals how the street was honeycombed with empty lots that generated modest income as surface parking lots. 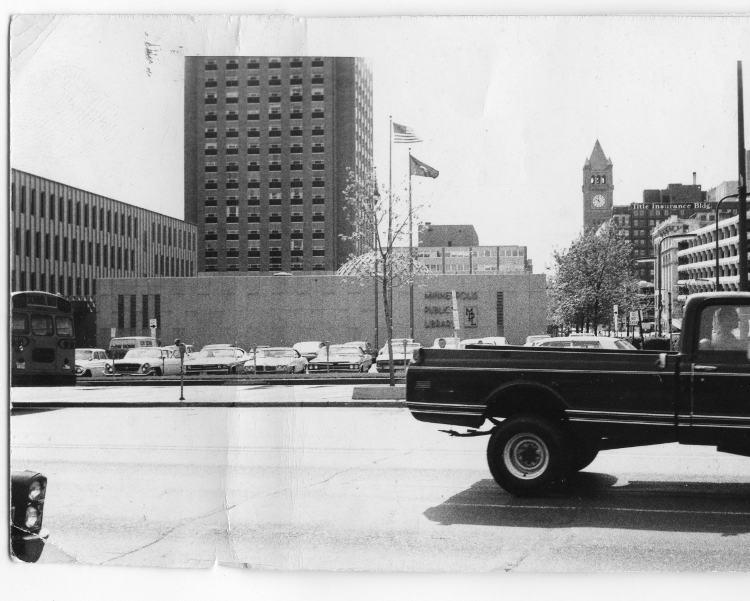 A billboard touting the coming Gateway Center–more than a decade after demolition began–towers over a sea of parked cars. 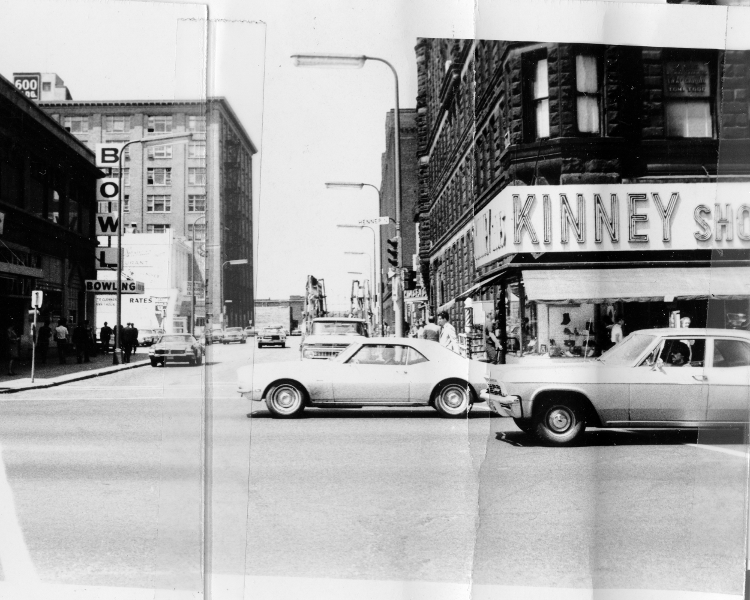 The success of the Nicollet Mall fanned enthusiasm for large scale urban renewal projects, making the deficiencies of Hennepin Avenue intolerable to city boosters. 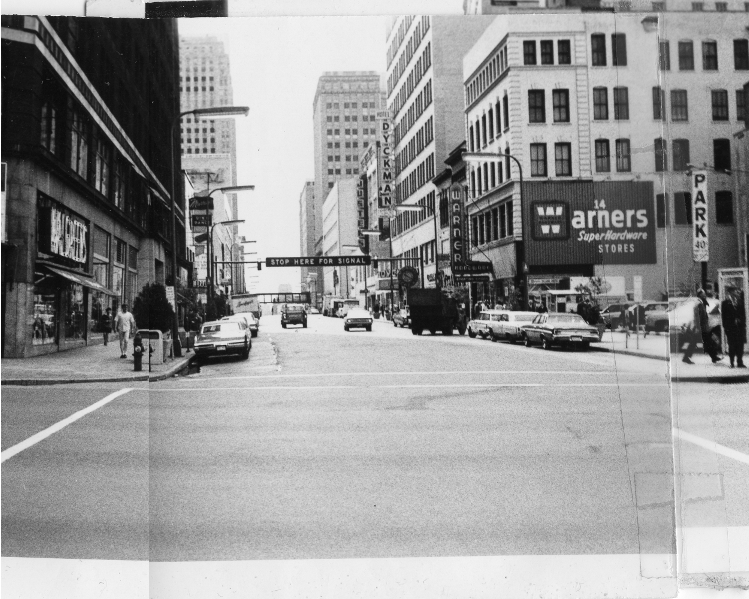 One year after the completion of Nicollet Mall, they commissioned its designers–Lawrence Halprin & Associates–to create a plan for improvement. 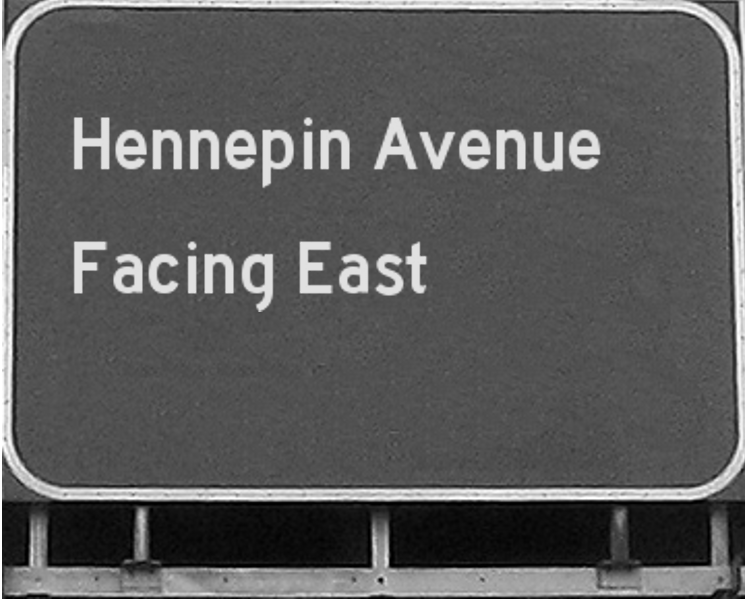 But when these plans remained on the drawing board, the Walker Art Center–in cooperation with the Minneapolis Downtown Council and the city Planning Department–organized a symposium that invited artists, architects, designers and urban studies specialists to pitch ideas for revitalizing the avenue. 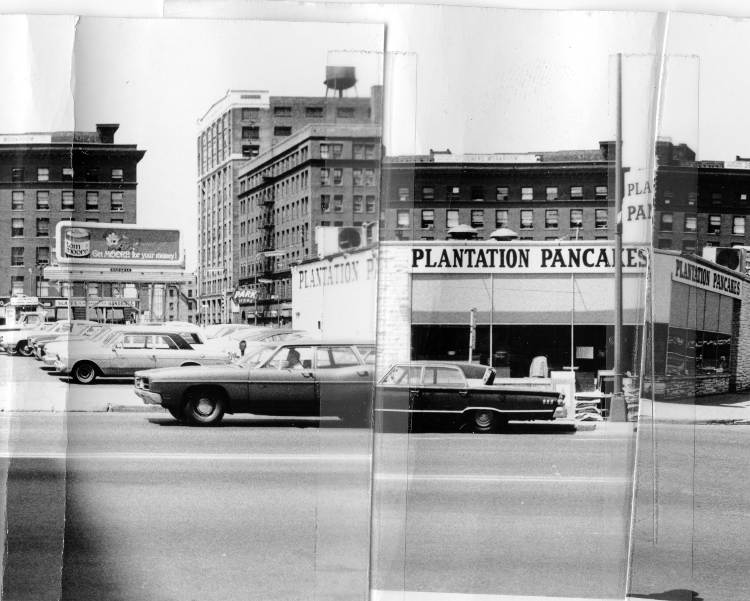 These sessions were held on April 25 -26, 1970 and likely inspired the making of this panorama. 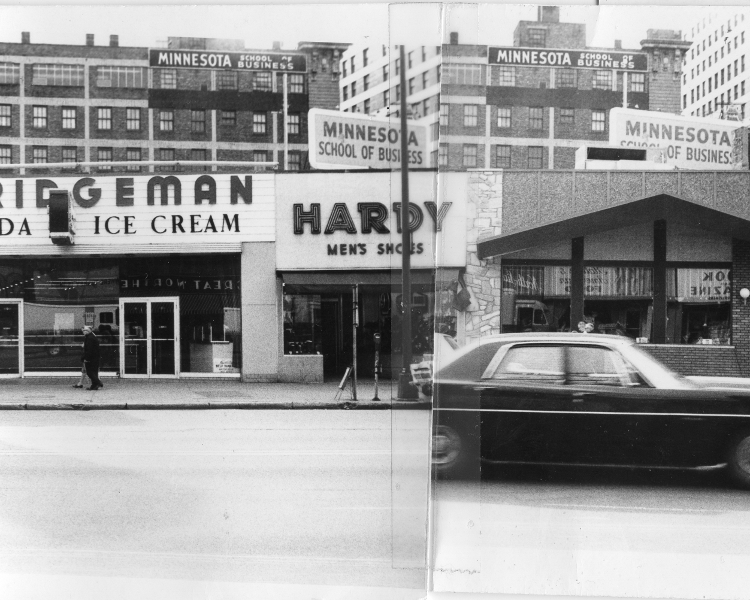 As the 1970s unfolded, Minneapolis might have been too busy enjoying its status as an urban paragon to take on the difficult and expensive work of redeveloping Hennepin. 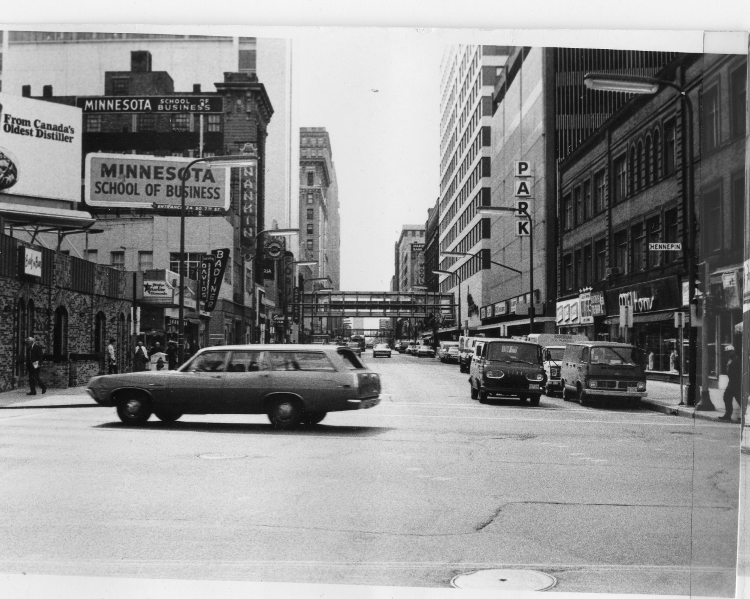 City leaders could take solace in the fact that at the depths of the urban crisis, Minneapolis seemed to be defying gravity. 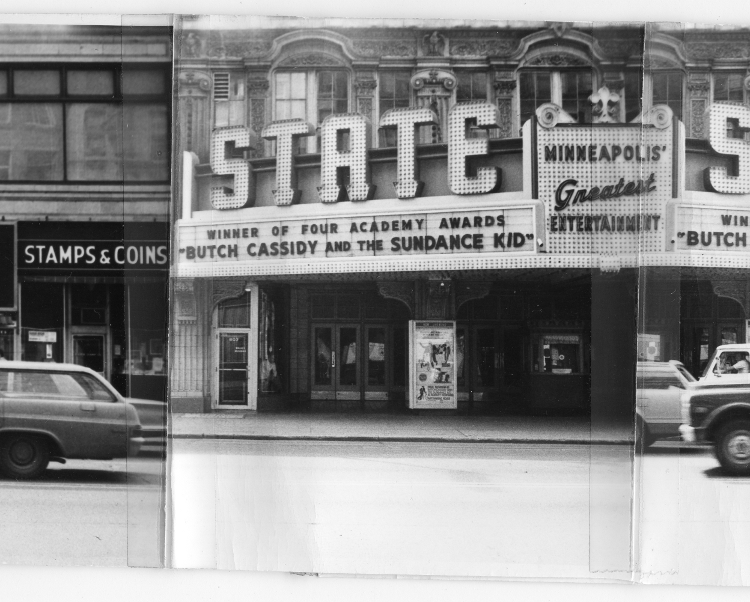 While other cities burned, Minneapolis glowed with life. 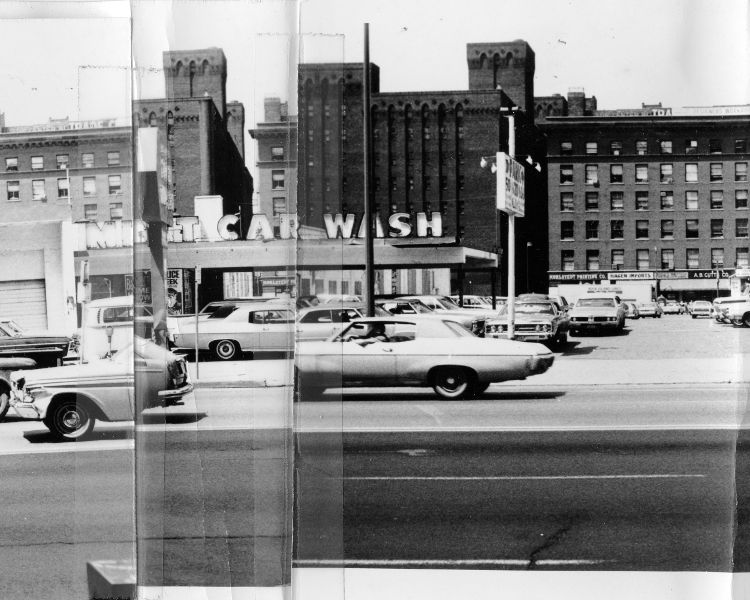 Moreover, as the Gateway Center redevelopment seemed to lose its momentum and neighborhood activists in Cedar-Riverside organized to halt the wholesale demolition of their neighborhood, critics of urban redevelopment were also gaining visibility. 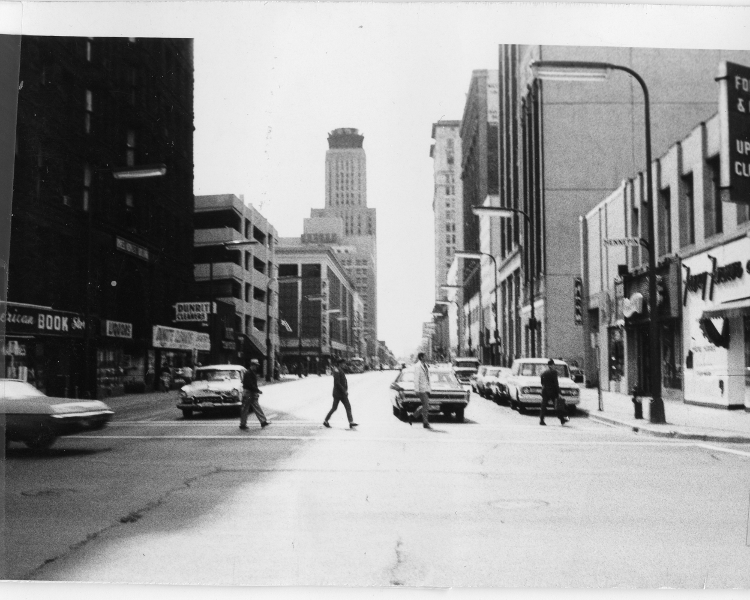 They urged Minneapolitans to embrace “Hennepin’s unpredictability and unconventional behavior” as “interesting and refreshing.” In 1982, it was these very qualities that inspired local artist Patrick Scully to make a quirky film about this stretch of downtown that he called “Shinders to Shinders.” Scully took the same gritty scene and used it as the backdrop for conceptual dance and music pieces that celebrated this stretch of Hennepin as the epicenter of the funky, new-wave urbanity of the 1980s. 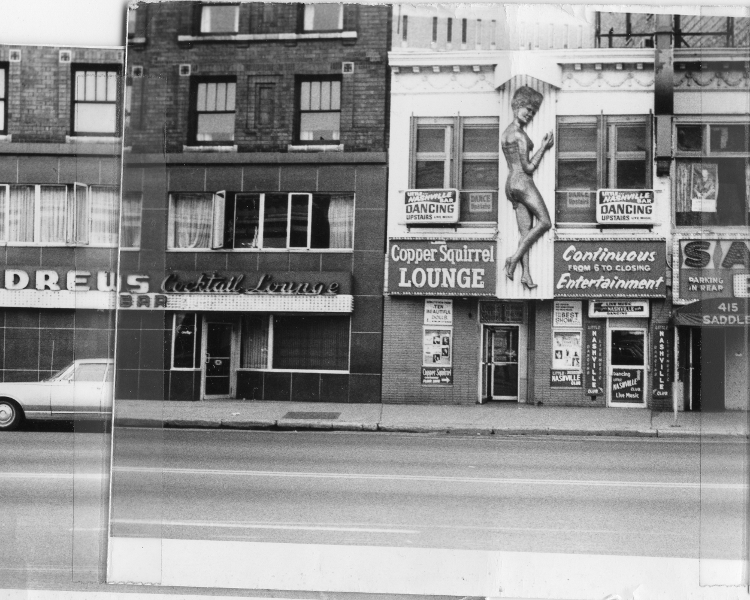 It was not until the 1990s that the “avenue” was subjected to a comprehensive redevelopment plan, which changed the streetscape but not the gritty and bawdy character of the city’s entertainment district. 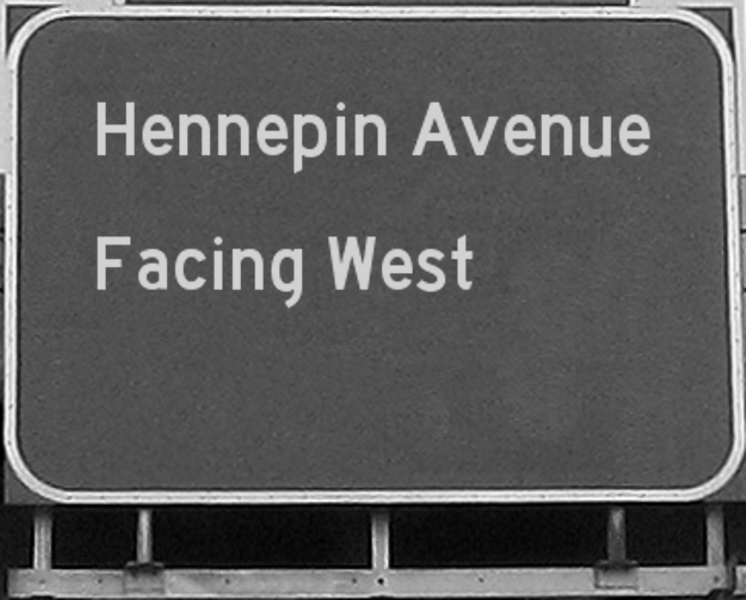 Sources for this post include Allan Holbert, “Dirty Old Man’s Guide to the City,” Minneapolis Tribune, April 26, 1970; The Report to the Mayor: Hennepin Avenue: Assumptions, Choices, Recommendations, April, 1979, Hennepin History Museum; “How Minneapolis Fends Off the Urban Crisis,” Fortune Magazine, January, 1976; Barbara Flanagan, Minneapolis: City of Lakes and Skyways (Minneapolis: Nodin Press, 1973); “Hennepin: The Future of an Avenue,” Design Quarterly, No. 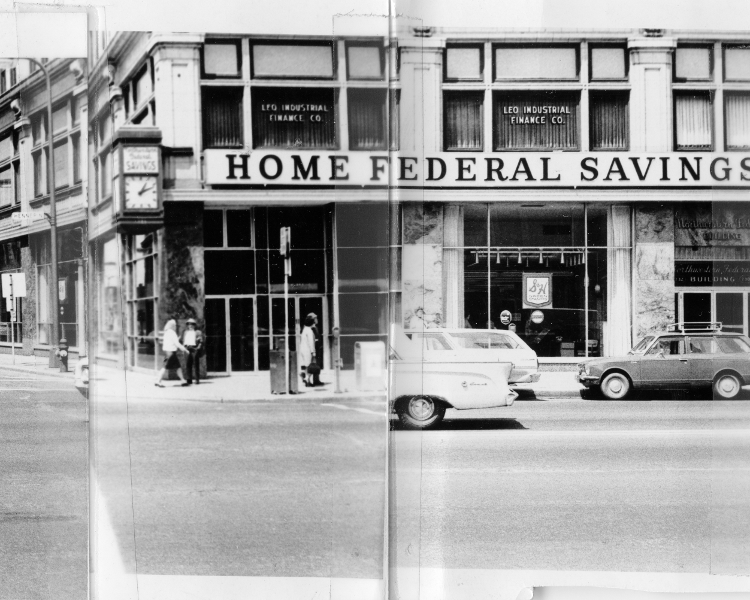 78/79, 1970: 59-63; Joanna Baymiller, “History of an Avenue,” Design Quarterly, No. 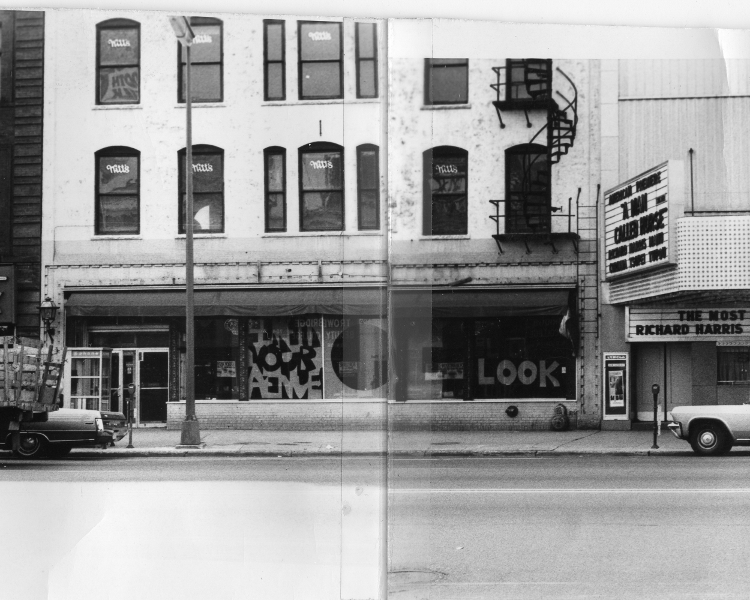 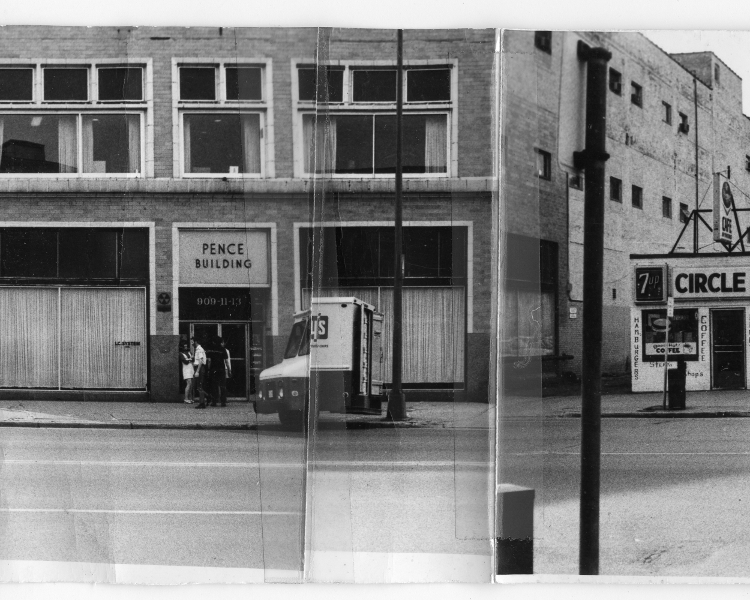 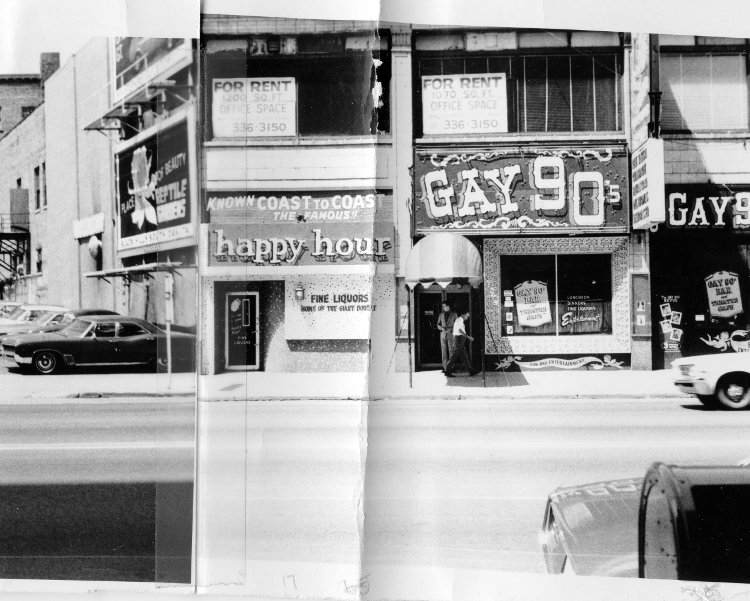 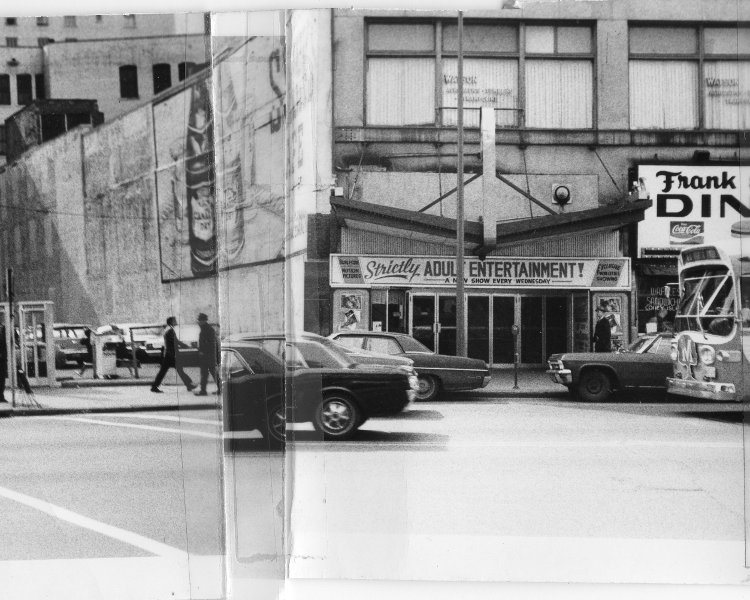 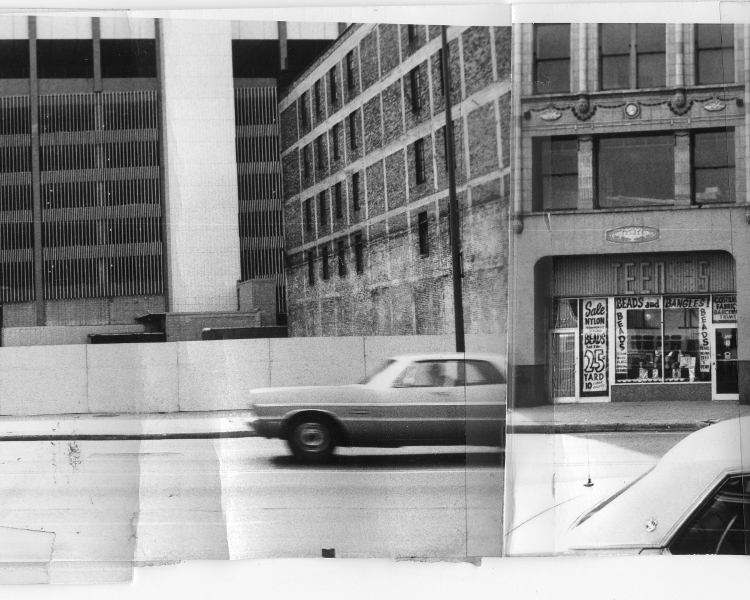 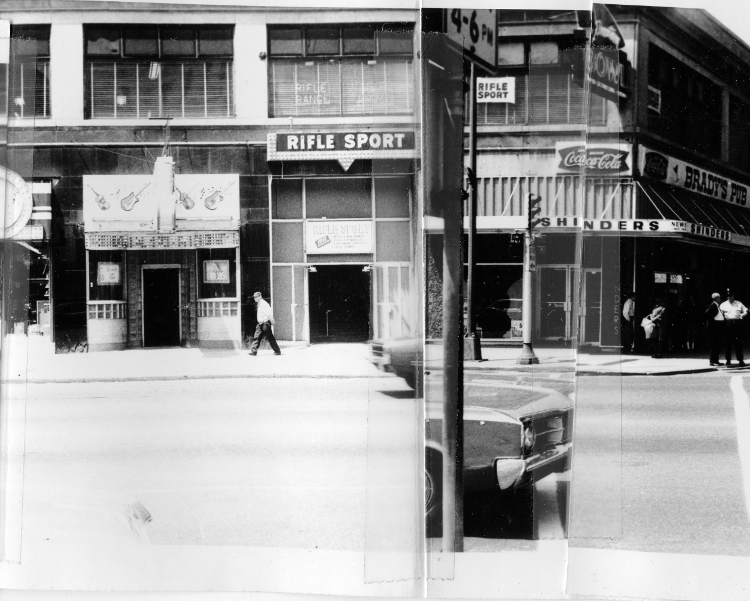 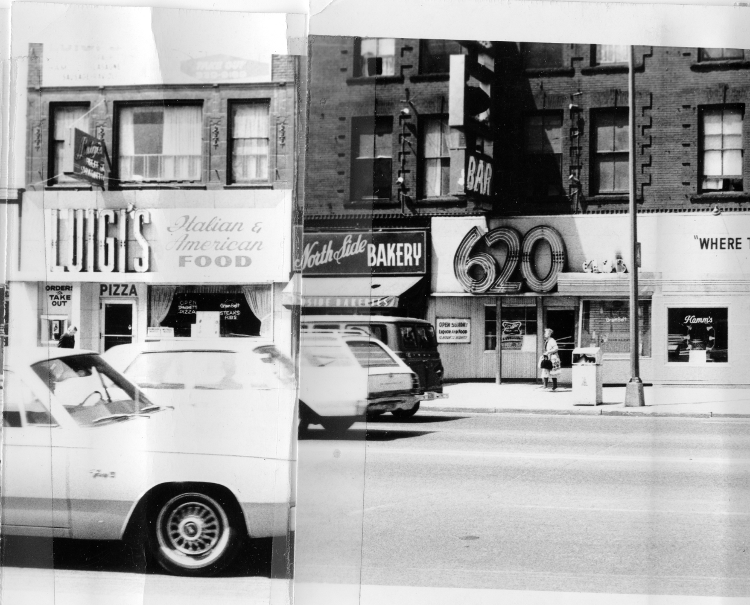 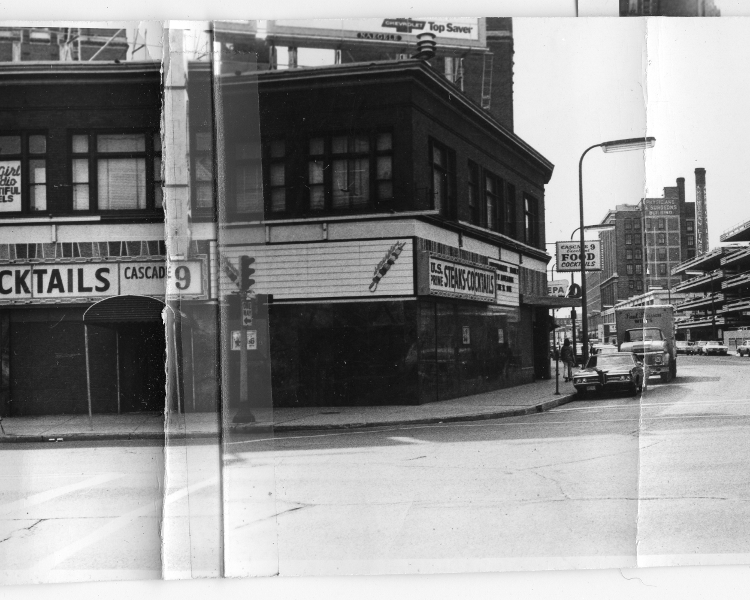 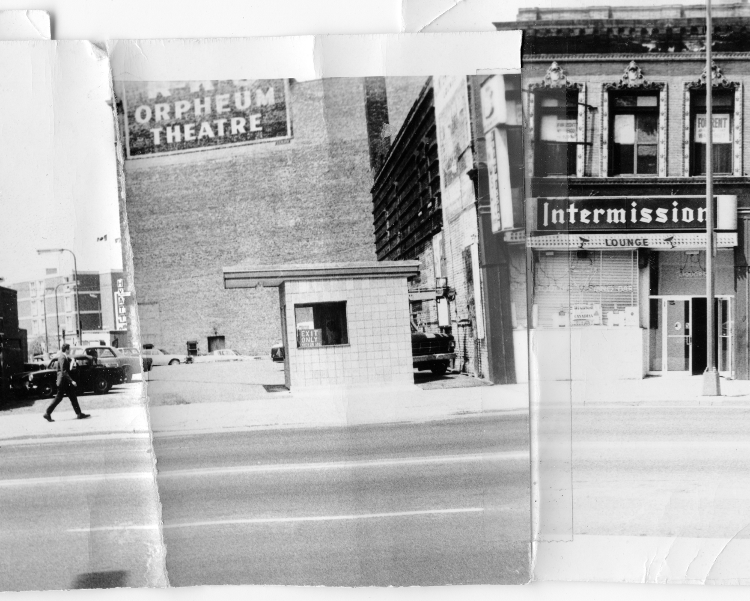 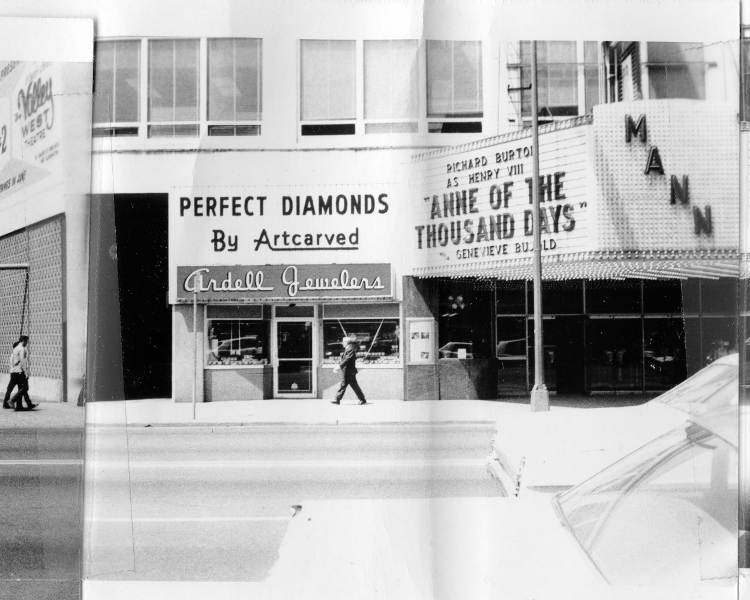 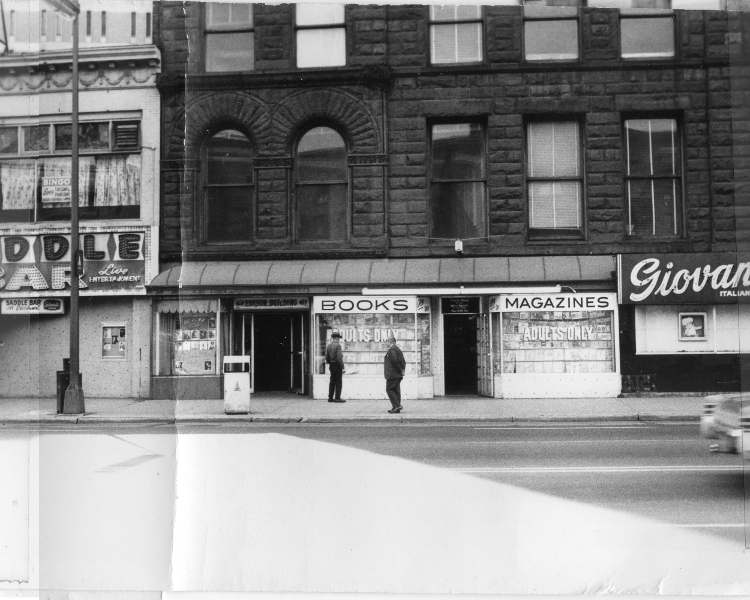 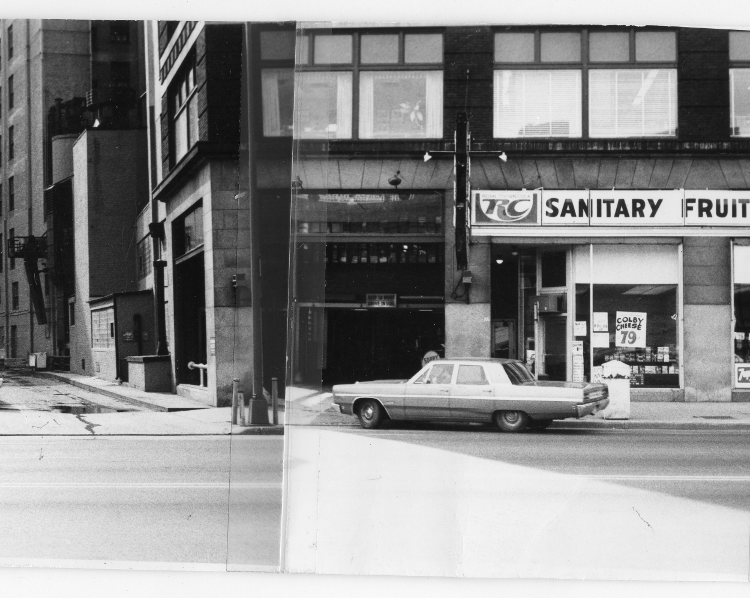 117, Hennepin Avenue (1982): 6-11; Rob Nelson, “Where Were you in ’82?” City Pages, Feburary 6, 2002.